Through the Sacrament of the Anointing of the Sick, our Lord Jesus Christ brings spiritual and, if it is for the well being of the individual, physical healing. You do not have to be in danger of death to ask for this sacrament. 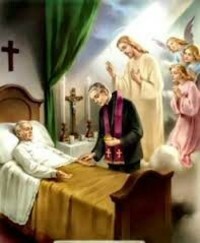 If you would like to receive the Sacrament of the Anointing of the Sick, please give us a call to the parish office so Father will be able to go and administer this sacrament.